Here at BlindsOnLine, we sell discount cellular shades that either filter or block light so that you can choose the shade that best matches your needs. 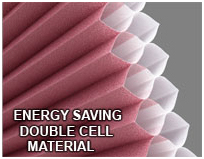 A major advantage of cellular, or honeycomb, shades is their energy efficiency. The layers of fabric work together to create a strong barrier against the outside temperature, keeping your home comfortable year around. Another characteristic of the discount cellular shades that we offer include the variations in the pleat sizes, which range from a 1/2 inch to 3/4 of an inch in width. These pleats are the visible distinction on cellular shades, setting them apart from other popular window treatments. From the side, the cellular structure is visible, but from the front, you just see a clean piece of fabric with measured pleats that extends to the bottom of the window pane. In addition to cellular shades, you’ll also find a wide selection of other discount window coverings, from simple aluminum mini blinds to wood blinds and skylight shades. Each product we carry is manufactured from high-quality materials so that the end result is more than just a low-price shade–it’s a quality home decorating idea. And, regardless of your personal style, you’ll find something to suit your taste here. When ordering your discount cellular shades, you’ll want to take accurate measurements of each window in your home and submit the results with your online order. These measurements will be used to process your custom order, so that the shades or blinds arrive at your home ready for installation. Our website has detailed measuring and installing videos for every product so there is no need to worry about getting the right shades to fit. Once we receive your order, you can expect your custom shades to ship in about five days.